April 1, 2019 We Have to Care! Good morning all and happy April first. For us on the farm, it’s a time for a micro-breathing and appreciating the blooming flowers and vegetables that we’ve bent over, nurtured and protected to get them to the point we can give them to you. That’s a pretty short description of all the work and care we put in to grow food. In my opinion, ‘food’ is pretty much taken for granted these days. I mean, for a lot of people, they don’t even get out of their cars for the calories let alone think about how ‘it’ gets there, from where it comes and who did the work let alone care about a little local farm. Yet we’re still here with the same message..local farms (meaning the people that know how to coax food from the ground) are vitally important for our society. Who and/or where else do you know where it’s a clean and safe environment not only for the crops, but for the multitude of life forms and clean air that we produce and protect. Where else can you pull a carrot or a radish from the teeming soil, watch Monarch butterflies or be delighted by a Praying Mantis? Certainly not from a public park! There’s a lot of assumptions about ‘farmers’. I know. I hear them all the time. One of my favorites when I try to get someone to understand how expensive it is to do this, is the one ‘well, don’t you get money from the government?” Seriously? First of all, it’s taxpayer money, not some nebulous definition of government and NO, we do not. So it’s up to us and our loyal band of customers that keep us going. So won’t you help by telling friends about our work, how important it is and actually step up and support? And buy a share for a military family through our Hungry Heroes or Produce for Patriots? It really does make a difference! As the sun came over the horizon this morning, it looks like a glorious day for harvesting the items in your deliveries this week. The spring carrots are oh so sweet and crispy and they won’t need a lot of cooking time if they even make it into your pot or stew. Radishes are plump and tasty from all the rain and are full of good nutrients too. Although there’s a lot of stress and strain with what we do, it’s always off set with kind notes from our shareholders, sometimes with appreciated encouragement, Being able to display the first sweet peas of the season is always a joy. There will soon be enough blooms to share with everyone. The report on the drive to increase our military donations is frankly off to a slow start. To date, we haven’t had anyone new sign up. I can’t help but wonder why. It gives the farm stability, helps appreciative families, many who come from a rural background and miss it, Won’t you set up and donate to a good cause. It takes a lot of resources and determination to keep the farm going. We’re doing our part! or through Produce for Patriots, the non-profit founded by one of our clients, Rob M.
March 11, 2019 Love Thy Neighbor? Oh dear. Yesterday was so busy from early on I forgot to post the items for the week! This little fellow is just one of who knows how many busy and breading gophers romping through our underground. One of them hit my artichoke plants couple of days ago and the scene was like from Caddy Shack. I was pounding on the ground with my feet in exasperation! We had a good light rain almost all last night soaking the soil. The sky is clearing and should be a great work day!! Let’s start with ‘good news’ like talking about snow peas! We have a small crop producing, unfortunately not enough for an item for everyone (the raccoons ravaged the roots of most of them) and they can be added to your deliveries for the next couple of weeks through the Green Store. They are so sweet and crisp and take just a minute or two to stir fry..that is if they’re not eaten raw just out of the bag. They take a lot of time to harvest but are so worth it! don’t miss out! For more serious news, I’d say most people if polled would say they think local farms are important to a community. But seriously, how many neighborhoods or communities even have a local farm anymore? I think you know the answer. Seabreeze has managed 30 years now to continually and determinedly grow food, flowers and protect the ecological environment for our fellow San Diegans and have done so with the support and participation of our loyal subscribers. And things change..people move away or have circumstances change and can no longer continue their support. 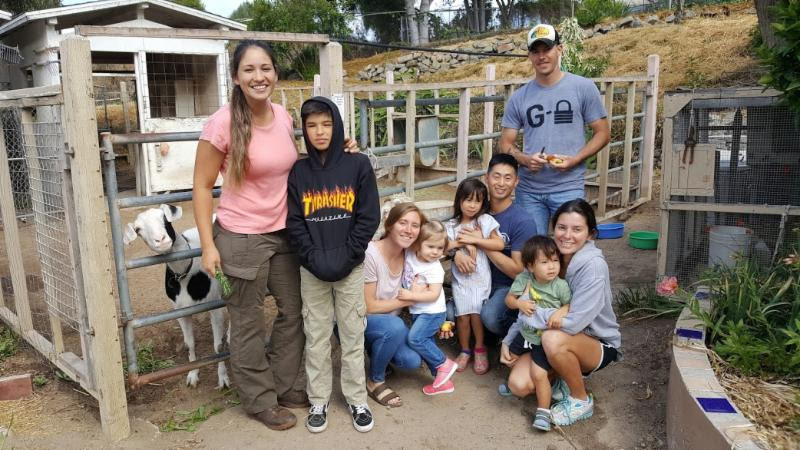 So we are asking you, our readers and current shareholders to help keep the farm’s base secure by signing up for our military family program, We’re on a campaign to provide for 10 more military family donations through our Hungry Heroes service this month. You can choose a weekly donation, every other week, or even once a month. It’s quite important work. If anyone has questions or suggestions, please feel free to give me a call and I’ll be happy to answer questions or help set you up. Will you be willing to join us in such important work? I look forward to hearing from you and will report next week on our progress. What a wild, wicked and wonderful week of weather it was. The vegetable plantings held up rather well..it was the flowers that got battered. The sun is out today and we’re counting on their resiliency, like the people, to reach into their roots and stand up tall to reach the sun. Believe it or not, the sweet peas are forming flower pods and soon they’ll be ready for bouquets to fill your room with their spring fragrance. What drama we San Diegans have had with these winter rain storms – high winds, lightning, thunder, sheets of rain, glorious cloud formations and trees toppled right across our access road! Whew.! It amuses me so the false representations of the life of a ‘farmer’… serene, smiling, the ‘freedom’, the life style, the security. I’d like to have one reporter out there with us today in the rain cutting the crops for the deliveries this week. Pretty sure they’d have one heck of an eye-opener day! If you would like to help support the farm and our work, please consider signing up for our Hungry Heroes program (click here for more information) that donates to appreciative San Diego military families or through Produce for Patriots (click here for more information), the non-profit founded by one of our clients, Rob M.
Pray for miracles, but plant cabbages. It’s been another busy week on the farm, not only with our normal 7 day work schedule but for some reason, we’ve had an exceptionally lot of calls and requests ranging from wanting to buy our pet goats for fresh meat, chickens for same, You Pick for watermelon, parents wanting to bring their children just to see real food in the ground (not shareholders) and someone wanting to park their RV here as they thought we would have extra land available! All in a day’s work.